"A map of Wakefield, produced in 1889, shows the streets of Wakefield, some of which have changed names during the past century. North Avenue was once Railroad Avenue, and Princess Street was Mechanic Street. In 1880, the population of Wakefield was 5,547. In 1890, the population jumped to 6,982 and by 1900, the census numbered 9,260. The total value of real estate in 1889 was $3,823,400 ($1,390,825 land and $2,432,575 buildings). The value of real estate and machinery of corporations was $731,050. The Town Report of 1889 noted that there were a total of 2,693 taxpayers in Wakefield: 1,489 of whom paid taxes on property, and 1,204 of whom only paid a poll-tax. Poll taxes of $2 were paid by a total of 1,945 Wakefield residents in 1889." -- Text from calendar by Jayne M. D'Onofrio. 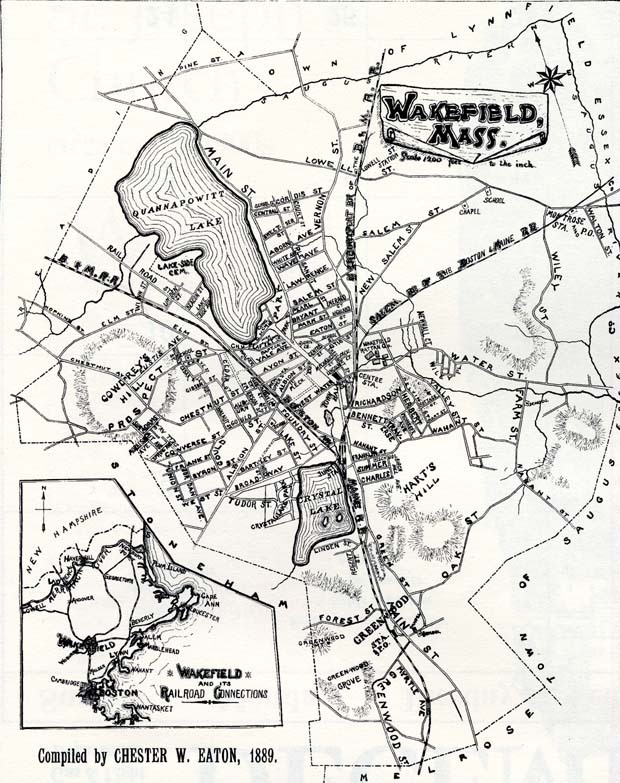 “Map of Wakefield, 1889,” NOBLE Digital Heritage, accessed April 22, 2019, https://digitalheritage.noblenet.org/noble/items/show/7027.